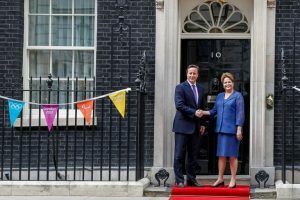 BRASÍLIA, BRAZIL – President Dilma Rousseff will meet with British Prime Minister David Cameron this Friday morning, as he arrives in Brazil for a trip that will include visits to São Paulo and Rio de Janeiro. On the table during Friday’s bilateral meeting will likely be science, technology, the Olympics and “an intensification of economic and commercial ties,” a spokesperson for the Brazilian Foreign Ministry, Itamaraty, said by telephone Monday. President Dilma Rousseff and British Prime Minister David Cameron meet in London during the Olympic Games, photo by Roberto Stuckert Filho/Presidência da República. Following a successfully London Olympic games, the focus of the sporting world has shifted to hosts-in-waiting Rio de Janeiro. In Rio, David Cameron will observe preparations for the games and, according to British newspaper The Mirror, hopes to be pictured with some of Brazil’s football legends. Historically, said Gian Luca Gardini, a lecturer in Latin American Politics at the University of Bath, relations between the UK and Brazil have been cordial, but have not run particularly deep. The current British administration is seeking to change that, recognizing the advantages of increasing its economic ties with Brazil at a time when its traditional trading partners – Europe, the U.S. – are slowing. “Since [the coalition government took office] the UK has implemented a strategy to regain ground in Latin America and in Brazil in particular, as the intense diplomatic and business activities and missions of the last two years demonstrate,” Dr. Gardini said. Trade between the two countries has grown steadily, hitting some R$17.1 billion in goods and R$5.3 billion in services in 2011 according to the São Paulo UK Consulate. The UK exports value-added goods including whiskey, cars, agrochemicals and pharmaceuticals to Brazil, while Brazil sells commodities such as gold, iron ore, meat and soya to the UK. British investors have flocked to Brazil too; attracted by a swelling middle class with increasing purchasing power, the country’s wealth of natural resources, and continued economic growth. The 2.7 percent Brazil’s GDP grew by in 2011 may have seemed relatively low to analysts, but it was a lot healthier than the UK’s 0.6 percent. “David Cameron will, in all likelihood be encouraging [Dilma Rousseff] to continue the process of opening up Brazilian markets to foreign investment,” said Benjamin Selwyn, Senior Lecturer in International Relations at the University of Sussex. 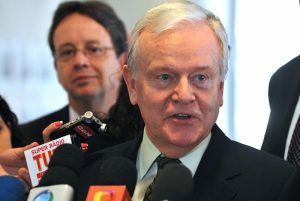 Robert Wilson, chairman of British firm BG Group, said earlier this month that they anticipate a twenty-fold increase in their oil output in Brazil over the next eight years, photo by Valter Campanato/ABr. According to figures from the UK Consulate, in 2010, the UK was the fourth largest foreign investor in Brazil with investments worth US$42 billion. UK companies in Brazil range from medical equipment manufacturers to oil exploration firms, a sector recently buoyed by British firm BG Group’s announcement that it plans to increase its oil production in Brazil by a factor of twenty over the next eight years, from 30,000 barrels per day at present to 600,000 barrels per day in 2020. The creative sector is also receiving special attention: A group of British creative companies, led by UK Trade & Investment (UKTI), arrived in São Paulo on Monday to meet Brazilian companies and the Secretary of Culture for the State of São Paulo, Marcelo Mattos Araújo. The Brazilian creative sector accounts for 2.5 percent of the Brazilian GDP, and the British television, music, digital and film companies will likely hope to capitalize on the extraordinary growth in this sector – roughly 500 percent over the past decade, fueled by the growing middle class. There are drawbacks to the Brazilian economy though, according to experts, such as heavy taxes and complicated legislation. However policies laid out in recent months to stimulate the economy are widely seen as encouraging, said Ricardo Gottshalk, an economist and former Economic Adviser to São Paulo state government. Isn’t it lovely David Cameron in Brazil? How overwhelming we are!! !